The media theorist’s story of so-called remediation is a familiar one. Each new medium is metabolized by the next—painting by photography, photography by film, film by television, all of it by the internet—and in turn, older media are reshaped in the mold of the new. But how does painting respond to photography? Television? The internet? 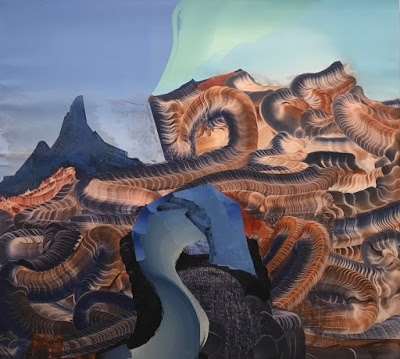 Elliott Green’s abstractions, smeared with shale-like layers of paint, offer a dizzying response: paintings that remediate computer graphics that remediates painting. Countless artists quote liberally from digital screens—for instance, Jack Whitten renders the home screen of an iPad as a painted abstraction in Apps for Obama, 2011—but Green, quite differently, appears to swallow the sponge, smudge, and brush tools of Photoshop, and then reconfigure them to make a real painting, the kind you can touch but are still tempted to click. Green’s paintings mostly evoke landscapes: foaming waters, horizons blurred by fog, and ashen mountains of a rugged Brueghelian sort. There are also intestinal paths of squamous terrain that bend to the sky, warping the perspective. Comparisons could be stretched to the scraped and streaked abstractions of Gerhard Richter or Whitten, or to the intensely magnified surveillance photographs of Trevor Paglen, but Green’s paintings are distinctive. Packing medium inside of medium, painting inside of Photoshop inside of painting (an effect that holds up best when viewed at a distance), these works resonate as utterly contemporary. Each passage of Green’s brushwork smirks like a nesting doll. To see more work by Elliott Green, CLICK HERE.